Automation brings several obvious benefits to any IT estate. These include more consistent performance of critical and mundane tasks and compliance with business processes. But when intelligently applied, IT automation can deliver significant additional benefits and business value. You need a clearly defined set of goals and a solid plan to achieve intelligent automation. And you need to ensure your IT management solutions are up to the tasks required. Join industry experts Mike Bombard, Robert Roberts, Director of IT Operations and Support at Segra and Michael Dortch for an informative, thought-provoking discussion of the benefits and challenges of intelligent IT automation. 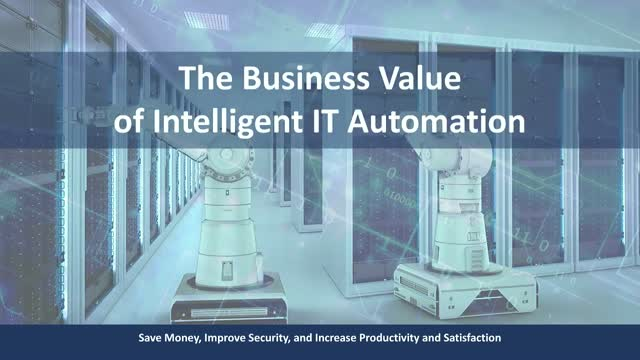 You’ll learn things you can do now and things you should be thinking about to achieve and extend intelligent automation across your IT estate. Michael Dortch, DortchOnIT.com / Robert Roberts, Segra / Mike Bombard, Virima Technologies Inc. Presented by: Michael Dortch, DortchOnIT.com / Robert Roberts, Segra / Mike Bombard, Virima Technologies Inc.